Bringing together psychoanalysis and politics has always been a fascinating, yet challenging task. In the long course of his writing life, Freud himself expressed his interest in politics. In fact, one of his most widely read books, Civilization and its Discontents (1930), is an account of political philosophy, while in Group Psychology and the Analysis of the Ego (1921), he prophetically depicts the appeal of fascism. 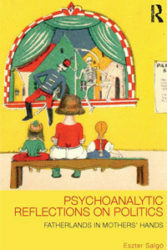 Other eminent thinkers of the post-WWII period, such as Erich Fromm, Theodor Adorno, Lionel Trilling and, most recently, Juliet Mitchell, Julia Kristeva, Jacqueline Rose, and Slavoj Žižek employed psychoanalysis in conceptualising politics. Eszter Salgó, in Psychoanalytic Reflections on Politics: Fatherlands in Mothers’Hands, picks up the threads from these authors in an attempt to, in her own words (p.1), ‘wed’ psychoanalysis with politics. And just as every marriage, this attempt comes with its happy moments as well as its weaknesses. The book comprises a brief introduction by the author, two parts including two and three chapters respectively, and a helpful index. The first part illustrates the theoretical background of the book, in which democratic politics are represented as a parents-children relationship: the political community is conceptualised as a ‘fantastic family’ consisting of the ‘children’, i.e. the political subjects or, rather the voters, the Winnicottian ‘good-enough mother’, who creates and maintains the transitional space, and the Lacanian ‘symbolic father’, who consolidates the desire with the Law. The second part of the book focuses on three examples of this ‘fantastic family’: Hungary, Italy and the ‘world community’. Salgó’s book presents some considerable advantages. Firstly, it gives prominence to very timely events; to name just a few, the rise of the Five Star Movement of Beppe Grillo, the triumph of nationalist forces in the 2010 Hungarian elections, the role of Facebook in politics, Wikileaks and Qaddafi’s rule in Libya. Secondly, it introduces some intriguing theoretical concepts, such as the ‘Name-of-Winnie’, standing for a symbolic teddy bear given to the ‘children’ by the ‘parents’ in order to engage them in the interactive game of democratic politics. Finally, the author explores some cases of the realm of politics which have never been studied together under the psychoanalytic prism: Hungary, Italy, and the ‘world community’. However, there also exist some weak points in this book. For instance, the reasoning provided by Salgó for the above-mentioned selection of countries (that she happened to have lived there) is rather personal and, thus, somewhat arbitrary. In terms of content, while the idea of a ‘fantastic family’ may, indeed, be an inspiring one, there is one parameter of any family that lacks further analysis here: the crucial role of siblings (or of their absence). Juliet Mitchell’s book Sibling (2003), for example, offers a marvelous account of how psychoanalysis, being preoccupied with vertical relationships, namely, the Oedipal confrontation, tends to neglect the horizontal ones, in other words, those between siblings. In Salgó’s employment of the family as a metaphor for the political community, while maternal and paternal functions towards the children-voters are adequately explored, the dynamics between brothers and sisters – which could symbolize the solidarity and competitiveness among political subjects – are hardly touched. Moreover, some minor structural issues need further attention: it would have been useful for the book to include a conclusion section as well as definitions of the applied terminology (e.g. ‘world community’, ‘national identity’, and ‘European values’), whereas the plethora of quotes throughout the book disrupt the narration at times. Finally, the way in which the fundamental idea of Salgó’s account, namely that democratic politics are seen as a ‘fantastic’ family, is applied, raises some methodological concerns. According to relevant bibliography on the implications of applying psychoanalysis outside the clinic, the political community, just as culture, art or history, cannot be treated like a patient on the couch. In other words, a scholar who attempts to apply psychoanalysis on politics is not identical to an analyst, precisely because the latter has at their disposal fragmentary psychic imprints from their analysand. Unlike scholars who appears to be in the know of their field, the analyst’s knowledge is channeled through and grace of their analysand. Thus, any attempt to transplant knowledge acquired in the framework of the psychoanalytic encounter per se to politics bears the risk of becoming an example of a ‘wild’ colonizing science. If the readers become aware of the above-mentioned risk, they are strongly encouraged to read this highly stimulating book.